Pray! 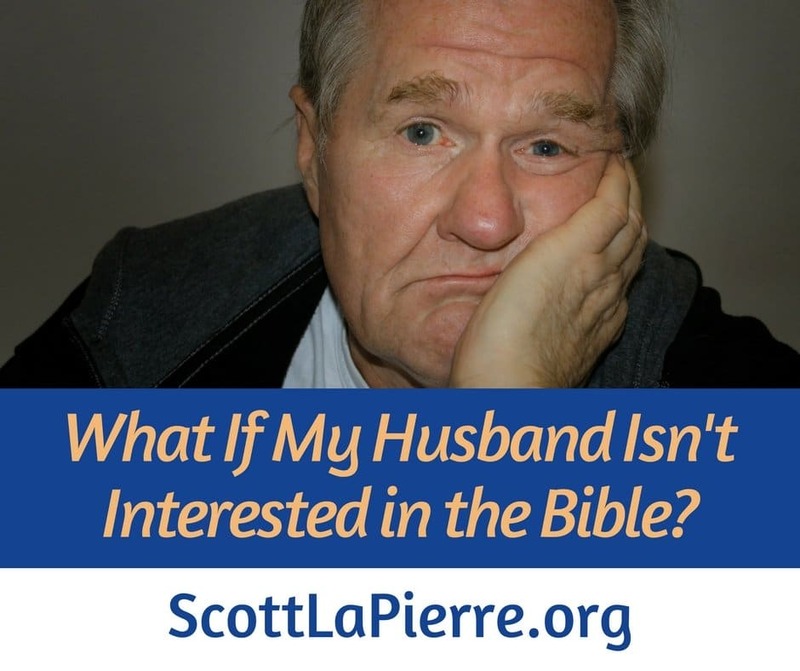 If your husband husband isn’t interested in the bible, you can’t make him be interested. Spiritual hunger and spiritual thirst is just that: spiritual. You can pray God gives him that hunger and thirst, but it’s not something you can give him. Encourage him! Be enthusiastic whenever he discusses Scripture. That will hopefully excite him about discussing it with you in the future. Ask him questions! Give him the opportunity to share. Keep your expectations low if he isn’t very studied. Do your best to prevent it from turning into an argument. That will only discourage him from talking about the Bible with you in the future. Your husband isn’t interested in the bible, but maybe following these suggestions will change that! We’re called to be at peace with others (Romans 12:18), but Paul specifically has marriage in mind in this verse. Peace is so important Paul says a believing spouse shouldn’t engage in conflict over an unbelieving spouse’s departure. Unbelievers are never won to Christ through heated conflict. It’s more important to be true to the Christian testimony of peace than attempt to keep an unbeliever in a marriage by arguing. If a wife wants her husband to read God’s Word more, pray more, or be a godlier man, rather than nagging him, she herself should read God’s Word more, pray more, and be a godlier woman. Wives should be encouraged by Jesus’s promise to send the Holy Spirit in John 16:8: “When [the Holy Spirit] has come, He will convict the world of sin.” Notice the emphasis is on the Holy Spirit doing the convicting. This includes husbands, unbelieving or otherwise! Wives are not supposed to take over the Holy Spirit’s role in their husbands’ lives. Wives should pray, and then trust the Holy Spirit to do the work Jesus promised He would do. No husband can sit at home being unspiritual and lame while watching his spiritual wife without feeling ashamed. A husband might pretend that he is not convicted, and his wife might not be able to tell by looking at him that he feels convicted, but he does. In contrast, when a wife is unsubmissive, angry, and nagging, the husband does not see God through her and as a result avoids feeling convicted at all. Then Katie briefly discussed not being the Holy Spirit in your husband’s life. There are no examples of polygamy being accompanied by peace and harmony. Every instance is characterized by turmoil and strife. Chapter 30 begins after Leah gave birth to four sons: Reuben, Simeon, Levi and Judah. But Rachel hasn’t been able to have any children. There weren’t (and many women would say still aren’t) many things worse for a woman than not being able to have children. Rachel feels feels terrible, especially when considering her sister – who also happens to be her husband’s other wife – just had four sons. Women are more emotional than men. Not having children was terrible, but talking about dying because of it is fairly melodramatic. Rachel held Jacob responsible. Was it really his fault she couldn’t have any children? Clearly not since he’d been able to have children with Leah. Rachel should’ve taken her petition to the Lord instead. Much of Rachel’s anger stemmed from Leah having children. This means her outburst was motivated by jealousy. Do you hold your husband responsible for your suffering? When you’re upset do you get upset with him? If you’re having a bad day, are you going to make sure your husband – or the rest of your family – has a bad day too? Is jealousy of other women planting a root of bitterness in your heart? How can I dwell with my wife with understanding, recognizing she’s the weaker vessel? It’s reasonable for her to be so upset, because her femininity is bound up in being able to have children. What can I do to encourage her? She’s giving in to the sin of covetousness. How can I help her overcome this weakness without being harsh? Instead, Jacob responded in anger and it pictures a common response from men. When wives are emotional it can be tempting for husbands to get angry in return, but this violates God’s command. It’s worth noticing everything Jacob said was right. He’s not in control of whether Rachel had children. But he’s still wrong because of the way he responded. As husbands we can be right, but still be wrong when we’re unkind to our wives. The holiday special on Marriage God’s Way: $24.99 for two books and this includes shipping. If you happen to read this post and want to take advantage of the special, contact me and let me know :). I totally agree with you when you mentioned that God cares more about peace in your marriage but I can saw from experience that when your not on the same page spiritually it can be dang hard and messy. I am the first to admit that I don’t read the word as often as I should but when I do I always share what I pick up with my spouse. His insight is valuable. I also agree when you said to Pray… God changes so much when we give it to him! I can saw from experience that when your not on the same page spiritually it can be dang hard and messy. 2 Corinthians 6:14 Do not be unequally yoked together with unbelievers. For what fellowship has righteousness with lawlessness? And what communion has light with darkness? I’m glad you share what you read in the Word with your husband. I hope he reads too. Yes, there are essentials or “hills to die on” in marriage, but we’ve often found in counseling many of the arguments are taking place over nonessentials. Battles that shouldn’t be fought! “Except for the greatest theological differences, God cares more about peace in your marriage…” This is very good advice for couples that disagree in their understanding of or desire for Scriptures. Yes, most couples will disagree in some areas. Just a question of whether those differences really need to create tension and conflict in the marriage. I would say no. Another awesome interview / post. I know firsthand that the best thing to do for your spouse is to be an example. When we were dating, my husband had left the church. It wasn’t that he stopped believing in God, but rather that the institution had failed him in the past. Over time, he began coming with me to church. By the time we were married, it was almost every Sunday. He slowly joined the Knight’s of Columbus (men’s group with a service focus with faith as a cornerstone.) Then a few years ago, he joined a men’s Bible study. 20+ years in the making, but now he dives deeper into Scripture than I have the time to do. Thanks for reading, commenting, and sharing the personal testimony. What a great example of 1 Peter 3:1 and winning over your husband the right way: without a word, through godly conduct. Glad to hear your husband is now following the Lord. These are really awesome tips! I am surprised after read all this. I am not married, but am appreciative because at the moment I just feel as if it’s not my time. These are handy for those that are measure married! But I know something about it. You’re right – albeit an adult woman never is aware of her husband is observance, God is! And God can use it! Thanks for sharing. Thanks for reading and commenting. Glad you found the post helpful. these are great tips! Though I am not married , and thankful at the moment I dont feel as if It is not my time. These will be handy for those who are married! Thanks Bianca. I hope you learned some tips that will benefit you when the time comes! These are such great tips! My marriage is a great witness to the life change God can work in a husband through the life (not nagging 😉) of his wife. While my husband was disengaged with church, God grew my faith and dependence on Him. He convicted me to stop trying to do the Holy Spirit’s job! You’re right- even if a wife never knows her husband is watching, He is! And God will use it! That’s wonderful to hear about your marriage, and I appreciate the nod you gave to 1 Peter 3:1 about a wife winning over her husband, not with words, but godly conduct! That is a great credit to you. Yes, best for wives to not try to be the Holy Spirit in their husbands’ lives. Thanks again for sharing your testimony! This is great advice. I find theology and apologetics fascinating. I am so glad my husband does too! Thanks Tara. Yes, it’s a blessing when a wife has a husband who’s spiritually-minded!